A carefree and untamed script font with a natural flow. Handmade with long organic strokes, Wild Spirit isn’t held back by any boundaries or expectations. It’s the perfect choice for personal branding projects, handwritten quotes, homeware designs, product packaging – or simply as a modern & stylish text overlay to any background image. • Wild Spirit – A hand drawn script font containing upper & lowercase characters, numerals and a large range of punctuation. 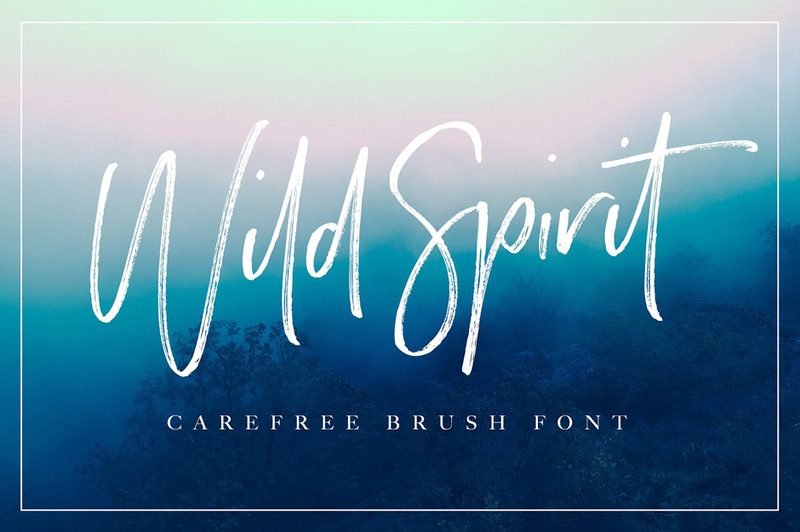 • Wild Spirit Alt – This is a second version of Wild Spirit, with a completely new set of lowercase and uppercase characters. If you wanted to avoid letters looking the same each time to recreate a custom-made style, or try a different word shape, simply switch to this font for an additional layout option. • Wild Spirit Extras – Simply type any uppercase character in this font to generate a swash, or any lowercase character in this font to generate a ligature. (Note – discretionary ligatures can also be turned on in OpenType software, which will automatically switch standard letter pairs into the provided ligatures). Fonts are provided both .TTF & .OTF formats. File size is approx 2MB (3.4MB unzipped), offered as a single download.